On the Atlantic coast of France, just 25km shy of the Spanish border, lies the city of Biarritz. We know it as the venue for the immensely popular Wheels & Waves festival, but George Woodman calls it home. 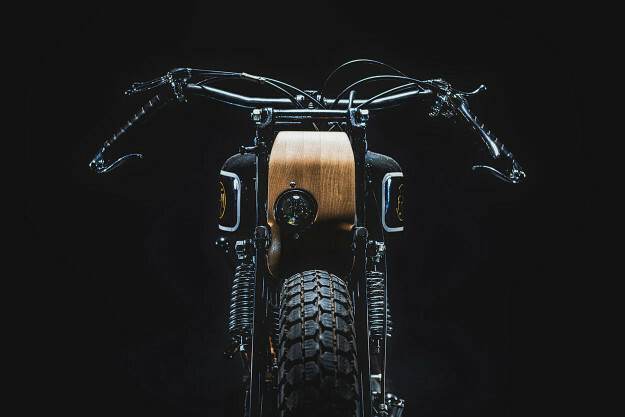 The enigmatic Frenchman refers to himself as ?an artist, working with wood, and in love with motorcycles,? rather than a ?customizer.? And yes, ‘George Woodman’ is a nom de plume. This is Sébastien Valliergues’ fourth build, and it’s one of the rarest bikes to ever grace these pages. You’re looking at an FN Type M70B?a 350cc single produced in 1929 by Fabrique Nationale d’Herstal. FN is a Belgian armaments manufacturer that’s been in business since 1889. They produced motorcycles from 1901 until the 60s, including the famed FN Four?the world’s first production four cylinder motorcycle. ?I was always very attracted to the very old machines from the 30s,? says Woodman. ?I find that to be the most elegant period of vehicle design, especially the first racing bikes.? Finding a vintage Fabrique Nationale is tough, but Woodman struck gold near the Swiss border. ?This FN was already a beauty from a previous restoration,? he explains. ?The owner is an old motorcycle cop who?s built up a mad collection of old-timers. He has over 40 bikes in his attic.? Many would balk at the thought of changing even one screw on such a classic machine, but Woodman had a vision. ?I had this idea of mixing wood with the bike, to reshape it in a retro-futuristic way.? He’s pulled it off in spectacular fashion. Rather than detract from the FN’s inherent vintage appeal, the wooden additions have made it all the more alluring. And they formed the bulk of the project’s timeline, with Woodman painstakingly shaping each piece by hand. The centerpiece of the build is the new seat unit?a wood and aluminum sandwich with a dollop of leather. It’s sitting on a custom-made hinge-and-spring system, with the original seat springs re-purposed out back for a little extra compliance. Everything’s been designed to use the frame’s original mounting tabs, minimizing changes to the original chassis. Woodman’s continued the wood theme with a neat headlight cowl and some smaller pieces?like a protector plate for the velocity stack and a nominal rear fender. The handlebars were cut and re-welded for a more vintage-race feel, capped with wrapped leather grips. Thanks to the previous restoration job, the engine hardly needed any work. Woodman simply added a Lithium-ion battery and a basic wiring circuit?to run the new head and tail lights. And he?s fabricated an aluminum hanger to keep the stand up when riding.